Our de-ethanizer stripper tripped after we attempted to start up the tower after a power failure that almost exclusively affected the refinery gas unit (see figure) — and we’re still trying to restart it. The fluid catalytic cracker and still suffered a ½-sec brownout but everything restarted without trouble. The rest of the refinery may not have been affected. The de-ethanizer trip occurred within a few minutes after we ran into an unexpected compressor trip when restarting the oil absorber upstream of the de-ethanizer. Within seconds after that compressor trip, the topside de-ethanizer high-pressure alarm activated and the top relief valve popped; the pressure control valve at the top of the tower did not open first as expected. What do you think caused our problems? Is it safe to start up the tower again? Have we damaged the compressor? Is there anything wrong with our start-up procedure? My advice is to find the engineer who knows how to start up this unit and follow that person’s directions. This likely will involve establishing feed from the upstream column first to provide liquid for the trays to counter the liquid/vapor from the reboiler. But, first, following sage advice from the late Trevor Kletz: inspect the process for damage. Never — I mean never — attempt to start up rotating equipment after a trip like this without at least a cursory safety review. The action of the pressure control loops at the top of the tower has me concerned. Re-evaluate the logic behind the pressure control loop and the relief valve. This is supported by the API recommended practice API-RP 576, “Inspection of Pressure Relieving Devices.” Two of its subsections cover necessary inspections: Section 5.2.4, “Inspection during planned shutdowns,” and 5.2.5.2, “Inspection after equipment test and inspection downtime” —pay particular attention there to item “f” covering leaks. In addition, I am concerned if there was a potential for two-phase flow in the pressure safety valve (PSV); check this immediately! That the pressure control valve (PCV) failed to open also is a serious concern; is the pressure transmitter at the top of the tower blocked? Or was the spike sufficiently fast for the control system to skip it without opening the PCV? You can expect to be down for at least a few days. Most refiners flare gas during periods of unexpected outages. Recovering ethane won’t drastically affect the upstream oil absorber. Focus your safety review around the utilities. If water was present in the stripper distillate and the propane refrigerant was left operating, then the tubes in the condenser are frozen with water condensate. In addition, there probably is residual heat in the reboiler from the hot oil; this could be a particular problem if the hot oil system continued to run during the tower trip. Could you divert hot oil circulation and propane flow automatically during a tower trip? Let’s consider what could have happened from the trays’ perspective. The hot oil retained heat. Once power was restored, the bottoms pump was started, causing a surge of vapor into the bottom of the tower. This led to jetting into the bubble caps or sieve tray holes, atomizing the remaining film of liquid in the bottom trays below the feed tray, which is at the top in a stripper. The surge of two-phase liquid and vapor might have been quenched by the hot liquid entering the stripper from the upstream tower — but I doubt it. This surge went straight for the compressor and caused the PSV to pop. You will need data to confirm this theory. After reviewing the control system log, inspecting the PSV, running simulations to determine the physical properties of the tower components and the behavior of the column itself, you will have to consider some tower improvements. Here’s a short list: 1) add a vapor/liquid separator at the top of the tower; 2) install a partial condenser or trap at the top of the tower to protect the compressor from water vapor that could later freeze in the recycle condenser; 3) consider water traps upstream of the stripper column, if possible, to augment protection; 4) review the start-up procedure to allow for conditions when only the gas plant is affected by a power spike, brownout or drop. In some cases, you may want to review backup generator assignments to ensure operation of critical equipment such as motorized de-inventory valves for the heating oil. A vapor/liquid separator could be a mesh pad or even a chevron-type separator for capturing droplets. As a rule, no tower should be operated without a vapor/liquid separator at the vapor discharge. The byproducts from our chlorination process are carbon tetrachloride and hydrochloric acid. We’re desperately trying to eliminate the CCl4 because we’re frequently tagged with air and water emission fines. During process upsets, which can last for up to a day, as well as startups and shutdowns, we send up to ten times our normal output of CCl4 and miscellaneous chlorinated alkanes to our treatment system. This is more than our activated carbon beds (ACBs) can tolerate. We use a group of ACBs for vapor removal and another set for liquid removal. We are following the EPA’s best engineering practices: “a granular activated carbon bed (ACB) followed by packed bed aeration.” The EPA allows a maximum contamination level of 5 ppb for water and 0.5 ppm for air. The “reportable quantity” for CCl4 is 10 lb/year. Our current process (see “existing” on Figure 1) involves four steps: 1) caustic scrubbing; 2) decanting; 3) washing/filtering; and 4) condensing the vapor. We have limited space on site because we’re located near a highway but we own several acres within 200 yards of the plant. A contractor has come up with an alternative design to avoid some of the solid waste created by the ACBs: an anaerobic reactor and aerobic biofilter for the liquid and a bubble column followed by an anaerobic reactor for the vapor (see “proposed” on Figure 1). What do you think of this idea? Can you suggest any other alternative unit operations that could effectively eliminate our outflows to sewer and air? What can we do about the air emissions from our distillation column? Our plant manager says just pay the fines and ignore the problem. Figure 1. Existing treatment system gets overloaded during upsets as well as startups and shutdowns. Send us your comments, suggestions or solutions for this question by October 16, 2015. 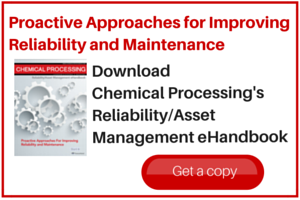 We’ll include as many of them as possible in the November 2015 issue and all on ChemicalProcessing.com. Send visuals — a sketch is fine. E-mail us at ProcessPuzzler@putman.net or mail to Process Puzzler, Chemical Processing, 1501 E. Woodfield Rd., Suite 400N, Schaumburg, IL 60173. Fax: (630) 467-1120. Please include your name, title, location and company affiliation in the response.